NASA’s Jet Propulsion Laboratory website is giving away a number of excellent space posters for free. You can download and print these posters and hang them on your classroom wall to inspire students and kindle their love for science, innovation, and creativity. 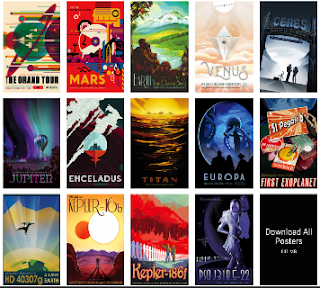 There are actually 14 posters spanning different space-related themes which you can download at the highest printing resolution either separately or in a single file (612 MB). The full size of each poster is 20 x 30 inches. Also, make sure you read the Jet Propulsion Laboratory Image Use Policy to learn more about details of use.